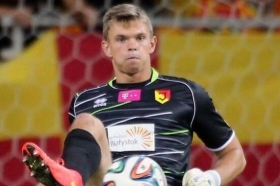 Goalkeeping talent Bartłomiej Drągowski is yet another highly rated young shot stopper to have emerged from Poland. The 6 foot 3 keeper has recently joined Serie A side Fiorentina from his youth side Jagiellonia Bialystok and is currently playing for the Viola's youth and reserve sides. Dragowski caught the eye in Poland with the club for which he started his career, aged just 17 the keeper made his first appearance in the Ekstraklasa against Korona Kielce. He went on to play a further 60+ games for the club before earning his dream move to Italy, where he has penned a five year contract with Fiorentina. The Florence based outfit have high hopes for Bartlomiej. Some even expect that he will be challenging current first choice and Romania's preferred international keeper, Ciprian Tătărușanu. Despite his 6 foot 3 height, Dragowski is surprisingly nimble. He has excellent command of his area and first class distribution of the ball. Dragowski is able to look after his defence with a superb eye for the game and has caught the eye of numerous other top European sides, despite having only just recently joined Fiorentina. The keeper has represented his country at every youth level, having played for Poland's under 17's, 19's, 20's and since 2015; the under-21's. He will be hoping to push on into the first team of the full squad in the coming years. Keep an eye out for this young man, he is sure to be one for the future.